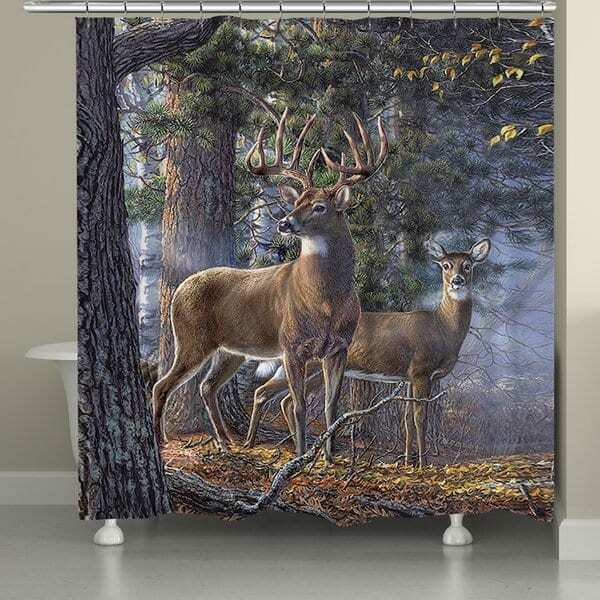 Bring the wilderness indoors with Laural Home’s “Majestic Deer II” shower curtain. This calming design features a majestic buck and doe standing side-by-side in a peaceful forest setting. The nature theme and tones will add serenity to your décor. This unique, art-inspired shower curtain features crisp, vibrant colors and images. my husband lit up when he saw this in our bath, the colors are vibrant. this is well made and I would recommend the purchase.. I bought this as a gift for a member of the family. It is truly like the picture and adds dimension to the shower area. Very pleased with the purchase. Vibrant colors. Very happy with purchase. Wonderful addition to my bathroom. Very good quality, price was good and delivery was quick. I love the look of this curtain and read that others were happy with it.